Manufacturing Holding Up The Economy? The manufacturing economy is running hot which brings uncertainty into economic forecasts because manufacturing is much more volatile than services. Manufacturing is smaller than services, but a big move can cause it to have a decent sized impact on the economy. I’m worried that weakness in services can be masked by strength in manufacturing. Then when manufacturing falls off a cliff like in 2015, the unmasked weak services sector makes the economy look like it’s headed towards a recession. I’ve had this fear since February. So far, it has proven to be incorrect as manufacturing has maintained its strength and the services sector doesn’t look bad either. It’s likely the manufacturing sector will turn in the next few quarters. However, it’s tough to say when that will occur. The chart below shows the construction and manufacturing industries’ employment growth compared to all other sectors. As you can see, year over year manufacturing and construction employment growth is about 3% which is near the growth peak in 2015. Since the labor market is tighter now, it will be even more difficult to maintain that growth rate in this cycle. While the overall labor market isn’t near full employment, the manufacturing sector is. If this cycle is like the last one, manufacturing job growth will be weak in 2019. The other sectors’ job growth is already near the lowest point in the past 6 years even though the economy is growing quickly, and capital expenditures are growing quickly. 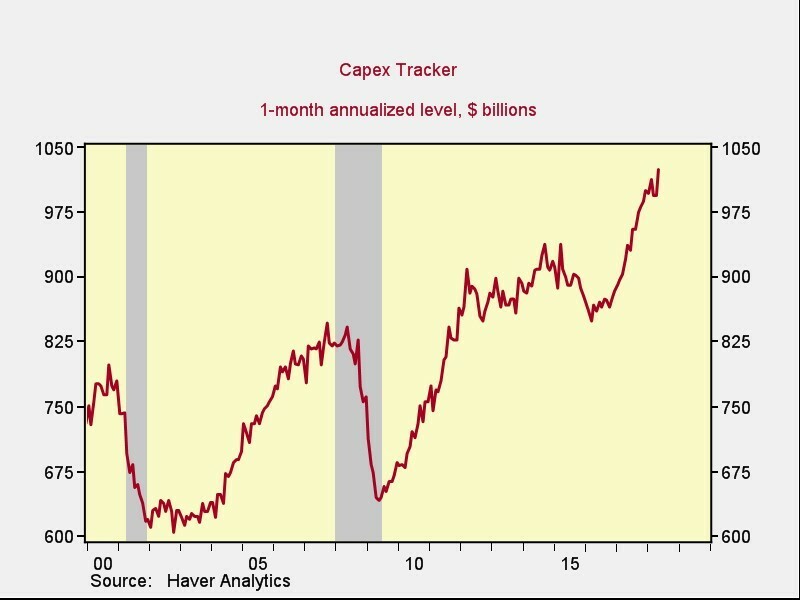 The chart below shows the resurgence of capex growth in the past 2 years. This growth is like the growth from 2010-2013. It’s almost as if the economy recovered from a mini-recession which lasted from 2015-2016. 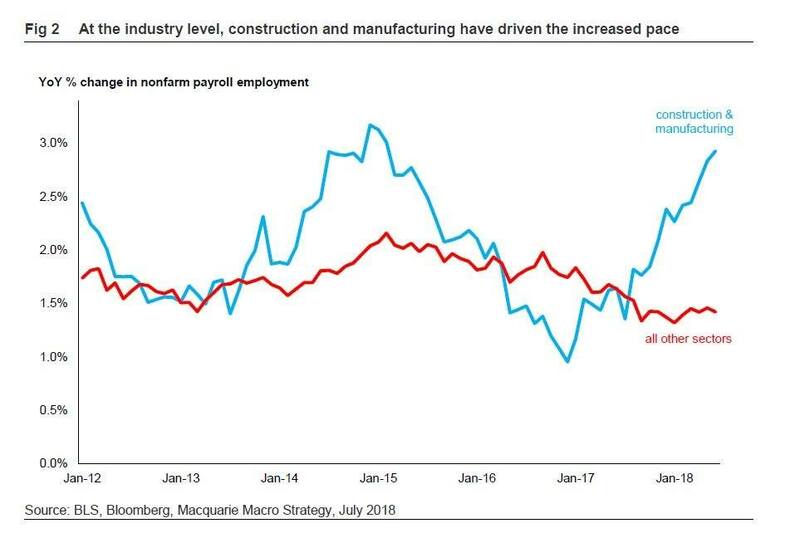 Obviously, the employment report looked good in June, but excluding manufacturing and construction, it wasn’t as great as the capex chart would indicate. Looking at the specifics of the June report, retail trade lost 21,600, financial activities only added 8,000, leisure and hospitality added 25,000, manufacturing added an amazing 36,000 jobs, professional and business services added 50,000, and education and health services added 54,000 jobs. Moving to the positive side of the ledger, the stock market isn’t at a record high despite huge capex spending gains. Firms are buying back stocks at record levels, the prime age labor force participation rate is improving, and weekly earnings growth is accelerating. This is a recipe for rising stock prices for the rest of the year. America has been able to do well even with the back drop of weakness in emerging markets and Europe. If some of those areas turn around, America will see even rapider gains. The yield curve is a viable investing tool when forecasting cycles. Just like any tool, it can be used inappropriately. This year, the curve will likely invert. This brings about statistics which can be manipulated to prove a point. Let’s review an example where the data can be presented 2 different ways. The curve inverted in December 1988, May 1998, and January 2006. The S&P 500 gained 33.2%, 39.6%, and 22.3% after the curve inverted. These are one final push higher at the end of bull markets. They seem like big performances, but they are the equivalent of picking pennies up in front of an oncoming train. That doesn’t mean I’m opposed to earning these gains, but they aren’t large in the context of an entire bull market. Looking at the data another way, in the 3 years following the curve inversion, the S&P 500 only returned 3.5% annualized while the Barclay’s Capital Aggregate Bond index returned 8.2% annualized in the same period. Investors should be reviewing their allocation in the next few months. It will make sense to shift capital away from stocks in 2019. The table below shows the past 5 cycles. As you can see, the curve inverted an average of 21.3 months before recessions. The average return looks decent at 12.7%, but it falls into the high single digits when you annualize it. In the late 1980s, there was a big final push which provided 28.5% gains. However, in the late 1990s, there was only a 6.1% increase. It’s important to understand how difficult it is to capture all the final gains in a bull market. If you sell a few weeks before or after the peak, much of these gains will be eliminated. As I mentioned, the 2015-2016 period was like a small recession. From mid-2015 to early-2016, the median S&P 500 stock fell 25% and the index fell 15%. The Russell 2000 fell 27%; the Japanese market fell 29%; emerging market stocks fell 40%; Chinese stocks fell 49%; and crude oil fell 76%. The 6 charts below review the economics of that very weak period. As you can see, industrial production was negative, business sales fell, S&P 500 earnings fell, and imports/exports fell. Retail sales growth was the weakest since the financial crisis and inventories rose sharply. 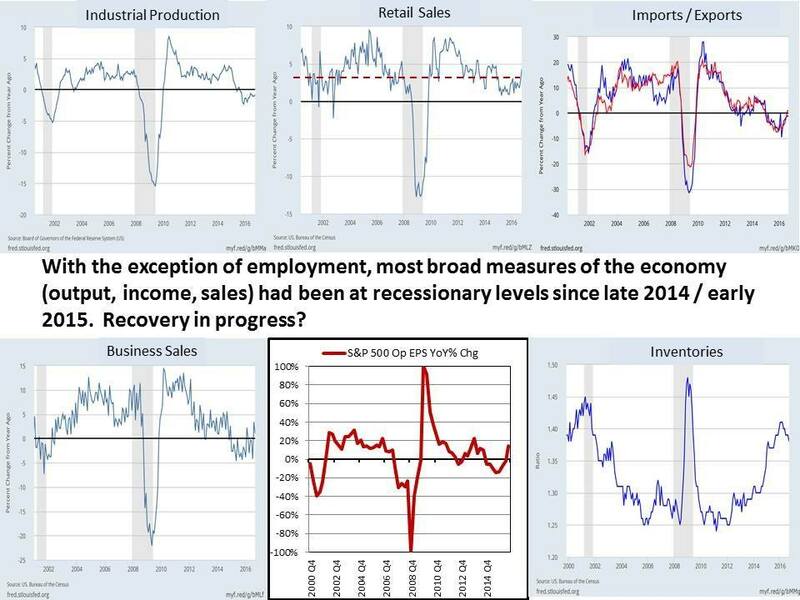 The questions this analysis pose are if we should only measure bear markets by the S&P 500 falling 20% and if we should only measure recessions by GDP growth being negative for 2 quarters. If that period was a bear market and a recession, it means this bull market expansion isn’t about to be the longest one since the 1800s. That should help the intermediate term bulls’ narrative. It’s the consensus that a recession will occur in 2020. If you were to argue the thesis that there are still a few years left in this bull market and expansion, you would start by showing how this bull market and expansion are still young. Some investors are bearish because the economy and stock market are due for a crash. I don’t believe in markets being due for anything because a catalyst needs to knock them down sharply. If you believe 2015-2016 was a bear market recession, it destroys the point that this bull market expansion is long in the tooth. Don Kaufman: Trade small and Live to trade another day at Theotrade. Neither TheoTrade or any of its officers, directors, employees, other personnel, representatives, agents or independent contractors is, in such capacities, a licensed financial adviser, registered investment adviser, registered broker-dealer or FINRA|SIPC|NFA-member firm. TheoTrade does not provide investment or financial advice or make investment recommendations. TheoTrade is not in the business of transacting trades, nor does TheoTrade agree to direct your brokerage accounts or give trading advice tailored to your particular situation. Nothing contained in our content constitutes a solicitation, recommendation, promotion, or endorsement of any particular security, other investment product, transaction or investment.